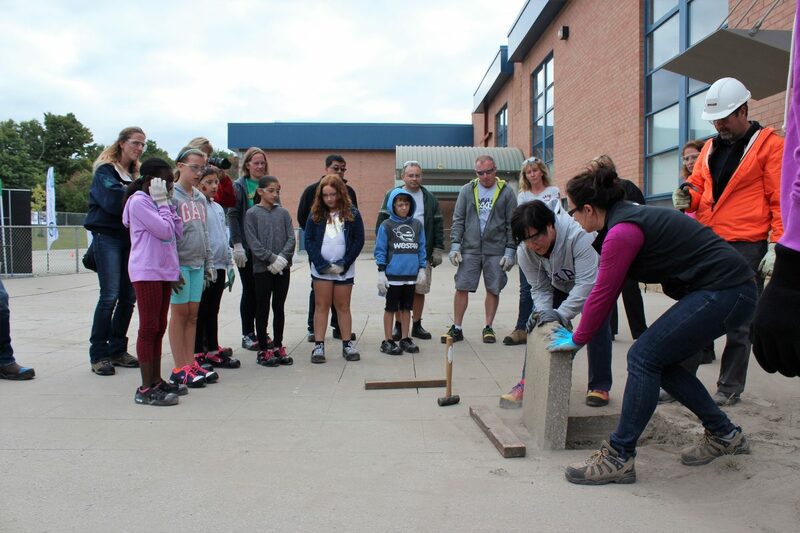 In 2017, the York Catholic District School Board completed school ground greening projects at over 15 schools thanks to an innovative partnership spearheaded by YCDSB and its school communities; urban eco champion, Evergreen; and the Regional Municipality of York. The partnership enables an Evergreen Landscaping Consultant to assist schools throughout York Region in planting trees and shrubs to increase the tree canopy in York Region. Tree canopies help local drainage systems run more efficiently, reduce heat and pollution, and benefit wildlife habitats. 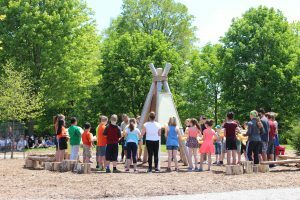 The partnership also help schools create outdoor spaces that expose students to the natural world, providing more hands-on learning experiences for students. Schoolyard “depave” events, where concrete playgrounds are broken up and replaced with natural materials such as mulch or grass, to allow for better drainage in an effort to reduce local flooding and heat from asphalt surfaces. Rain gardens are also created for these reasons. Creating outdoor classrooms and log seating (benches) so that students can better experience nature as part of their school learning environment. They also help students develop environmental stewardship skills, and promote better mental health. 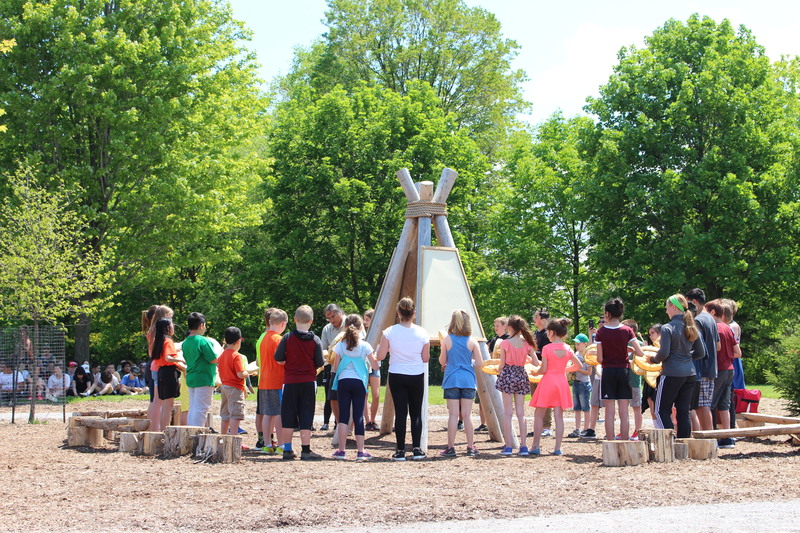 Creating play structures made of logs and other natural materials to encourage students to explore nature and participate in outdoor physical activities while having fun. Planting native species trees and shrubs to increase the tree canopy and promote bio diversity. The York Catholic District School Board thanks the schools that participated in school ground greening projects in 2017, for their enthusiasm and efforts to enhance the environment, and teach environmental sustainability. YCDSB also thanks the many people, community organizations and businesses that sponsor the various school projects, and looks forward to continuing its work with Evergreen and the Regional Municipality of York in 2018, so that all area residents and future generations can benefit from these environmental initiatives. 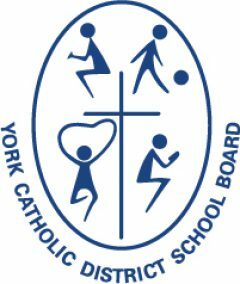 The York Catholic District School Board is one of the top-performing school boards in Ontario. It delivers educational programming to approximately 55,000 students in 103 schools throughout York Region. YCDSB has won multiple awards for its innovative environmental initiatives and is a leader in school board ecological sustainability and conservation.